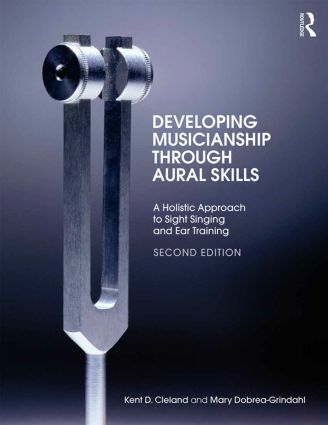 Developing Musicianship through Aural Skills, Second Edition, is a comprehensive method for learning to hear, sing, understand, and use the foundations of music as part of an integrated curriculum, incorporating both sight singing and ear training in one volume. Under the umbrella of musicianship, this textbook guides students to "hear what they see, and see what they hear," with a trained, discerning ear on both a musical and an aesthetic level. Revised organization, with exercises gradually progressing from the simple to more difficult, taking beginner students’ varied skill sets into account. The text reinforces both musicianship and theory in a systematic method, and its holistic approach provides students the skills necessary to incorporate professionalism, creativity, confidence, and performance preparation in their music education. The second edition of Developing Musicianship through Aural Skills provides a strong foundation for undergraduate music students and answers the need for combining skills in a more holistic, integrated music theory core. Kent D. Cleland is Professor of Music Theory at the Baldwin Wallace Conservatory of Music, where he has taught music theory and aural skills since 1999. Mary Dobrea-Grindahl is Professor of Piano and Coordinator of Secondary Piano at the Baldwin Wallace Conservatory of Music, where she teaches solfège, Eurhythmics, pedagogy, and private piano.